When Kapitänleutnant Walther Schwieger steered U-20 into the Atlantic early in May, 1915, his decision had tragic consequences for Borders families. Schwieger and his crew had enjoyed a successful run that spring in the opening months of the Great War. A satirical British replica of a medal struck in Germany in 1915 on their sinking of the SS Lusitania. In Britain it was replicated by Selfridges in 1916 to arouse anti-German feeling. Over 250,000 were sold. But with only three torpedoes left in its arsenal and running low on fuel, Schwieger decided it was time to head for the North Atlantic’s open waters and home. U-20 entered the Irish Sea on May 5 and two days later – 100 years ago to the day – on the morning of May 7, the U-boat claimed its third, and most famous, victim. Schweiger was unaware that the sinking of the ship, currently steaming straight for him, would bring him and his crew not just everlasting infamy, but also ultimately draw the United States of America into the First World War. The ocean liner, SS Lusitania, had left New York City on May 1 bound for Liverpool. Mercantile Marine War Medal awarded to Barton by the Board of Trade to members of the Merchant Navy who sailed in 'dangerous waters' during the war. The afternoon of May 7 found her sailing off the coast of Ireland within easy reach of her destination. Known as the ‘Greyhound of the Seas,’ the Lusitania was the fastest liner afloat and relied on her speed as the best defence against the threat of submarine attack. However, that particular afternoon, Cunard’s Clyde-built Lusitania was not running at full speed because of fog. Nor was the ship taking an evasive zigzag course. It was a sitting duck and was headed straight into the periscope sights of the U-20. Within 20 minutes of U-20’s second torpedo striking her hull, the Lusitania had vanished beneath the waves taking almost 1,200 doomed souls, including 138 Americans, with her. A photo of Barton's journal entry listing all of the engineers on the Lusitania and whether they were lost or saved. And it was while staff of Hawick Museum were doing research for the town’s contribution for the National Museum of Scotland’s exhibition ‘Next of Kin’ – a lottery-funded touring project which centres on revealing the personal experiences of Scottish families during the First World War – that they came across a unique set of diaries for the years from 1898-1938. These diaries chronicle the life of Edward Barton, a marine engineer with the Cunard Shipping Company, and record his everyday maritime duties and problems. But they also record the link between Barton and a number of other Borderers with the Lusitania. Barton was born near Teviothead in 1876. It was in July 1893 that he began his engineering apprenticeship with the Hawick firm of William Melrose & Sons. Five years later he joined the Cunard Steamship Company and went on to serve for 30 years on numerous vessels belonging to the famous shipping company. In 1909 he joined the Lusitania as fourth engineer and remained with the ship for four years. In July, 1914 he became chief engineer on SS Ultonia and it was while docked in New York on April 26, 1915, that he boarded his old ship, Lusitania, to visit two of his former ship-mates – noted in his diary as W. Hetherington and G. Little –before they embarked on their final, fatal, voyage. The entry in his diary for May 9, 1915, makes stark reading: “Report that the ‘Lusitania’ has been sunk”. His entry the following day is even more tragic: “Worse report this morning there are 1400 lives lost in the sinking of the ‘Lusitania’ some 750 saved.” The eventual official loss of life was put at 1,198, with 761 saved. On the fly leaf of the diary, Barton names 29 engineers who served on the Lusitania. Amongst the ‘lost’ was Hetherington, although Little was saved. The Southern Reporter issue of May 13 for that year contains an interesting report concerning the sinking of the Lusitania. 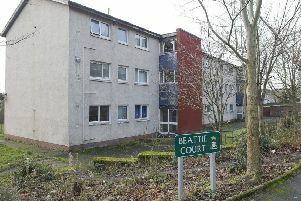 Surprisingly, the report also records that another two Borderers were saved; senior second engineer Andrew Cockburn, whose father, a retired engineer, lived at Croft Street in Galashiels, and the Rev H. C. S. Morris, whose parents lived in Melrose. Rev Morris was on his way home, on vacation, from Trinity College in Toronto. A Peeblesshire family, however, had mixed fortunes. James Aitken, his son James and his two-year-old grandson, also James, were lost while his 16-year-old daughter, Chrissie, was saved. The sinking of the Lusitania fuelled anti-German feeling throughout the country. In Hawick, reported the Hawick News, “....the windows of the shop of Mr Spreng, pork-butcher, Howgate, were smashed on Monday night”. German-owned shops in Berwick, Dumfries and Annan were similarly attacked. A satirical British replica of a medal struck in Germany in 1915 on the sinking of the Lusitania was replicated by Selfridges in 1916 and over 250,000 were sold. In October, 1917, Hawick Museum was donated one of these medals along with its certificate. Shona Sinclair, current curator at Hawick Museum, told us: “It is a real privilege and a coup for Hawick Museum to have been chosen to host this Next of Kin exhibition, which will include Edward Barton’s diaries and commemorative Lusitania medal.